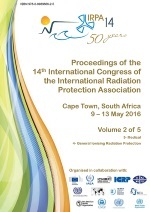 These proceedings comprise 244 papers and 660 abstracts, including contributions relating to the Prize lectures, the twelve topical areas highlighted at the congress, the 50th Anniversary of IRPA celebration session, the 20 Refresher Courses, and the presentations of the Associate Societies. Being more than 2000 pages in total, they are divided into five volumes, each available here for free download. IRPA intends to prepare a Comprehensive Edition of the IRPA 14 proceedings: a single pdf with the full contents of all of the volumes above and any additional papers erroneously not included in the five-volume set.